Mo-roccan This Dish! All Aboard the Marrakesh Express! Got a lot of requests for my recipe for my spicy toasty quinoa dish whose photo I posted to our Facebook page last week, so, flushed with appreciation, je te presente! I've been reading Jack Turner's Spice: A History of a Temptation recently. Lazing on the front porch in the steamy humidity of our mid-Atlantic Memorial Day weekend, it was not hard to drift away to the spice islands. Dinner beckoned, and well, "When the schmeckon beckons" whom am I to say no? The cupboard yielded: organic red quinoa, cashews, and chickpeas, cumin, and garam masala (an aromatic, sweet, slightly spicy blend of cardamom, cinnamon, cloves, cumin, black pepper,and coriander). The fridge yielded organic carrots, gold beets, Medjool dates, and a lemon. The freezer had a bag of frozen peas to be used before I could get fresh in season. The garden begged me to pick from our already groaning mint bushes. What to do? Spices always take me to those colorful towering cones of spices in the Moroccan Medina, so some kind of Moroccan inspired dish. Who was I to know that later that week Bravo TV's Around The World In 80 Plates would land in the Medina in Marrakesh? Incidentally, kudos to the copywriters at the Bravo website for coming up with a line I'd be proud to have owned, "Funky cold Medina!" Without further ado, voila! Quinoa is an ancient grain of the Incas and contains all the essential amino acids necessary for our bodies to synthesize protein. As such quinoa is a complete protein and is a low-cost, healthy substitute for all or part of meat in a dish. I love to cook with spices - any dish when cooked fresh, or added to leftovers can be enriched. 2 large sprigs fresh mint (yields 2 tablespoons chopped). Any variety. I had chocolate mint. Rinse the quinoa with water in a sieve. Set aside. Heat a dry cast iron skillet. (no need for oil). Add quinoa and cumin, and spread with a spatula. Heat for a couple minutes. Add drained can chickpeas and cashews. Continue heating, spreading with spatula. Remove from heat when quinoa starts to jump and smells like popcorn. Do not burn the quinoa. It will spoil the dish. It is OK to have a little 'char' on the cashews and chickpeas. 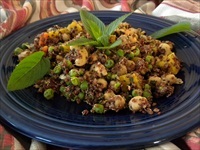 Remove chickpeas and cashews from quinoa and set aside. Boil 1 cup water and add quinoa. Simmer covered for about 15 minutes until the little 'tails' pop out of the quinoa seeds. It's OK to have the quinoa 'al-dente', just not rock hard! Roughly chop the carrots and beets. Add together with peas to a steamer and steam until still a little crunchy. In a non-reactive bowl, combine the freshly squeezed juice of the lemon (about 2 tablespoons) with the garam masala and chopped mint. Add vegetables, chickpeas, cashews, chickpeas, Medjool dates, and cooked quinoa to dressing. Mix well. Plate. Garnish with lemon rind and fresh mint. Eat immediately. Also delicious cold when made ahead. Popular at summer cookouts.